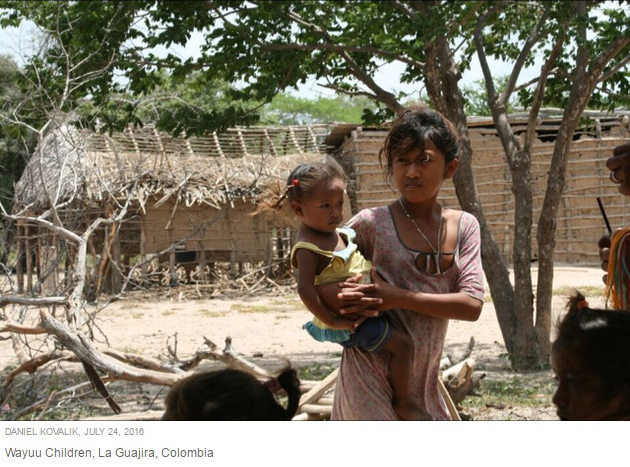 Earlier this week, on August 1, the Supreme Court of Colombia ordered President Manuel Santos and other individuals and entities to take all appropriate and necessary measures, in an efficient and coordinated manner, to ensure that children and adolescents of The Wayuu indigenous community receive access to clean drinking water, food, health care, housing and other basic amenities necessary for their survival. This order follows the December 11, 2015 decision of the Inter-American Commission of Human Rights (IACHR)which directed the Colombian government to take similar immediate “precautionary measures” to ensure the lives and personal safety of Wayuu children in La Guajira, Colombia. The IACHR decision was prompted by the documented deaths of 4770 Wayuu childrenduring the past 8 years as a result of thirst, malnutrition and preventable disease. For their part, The Wayuu claim that over 14,000 children have died. In any case, these numbers are staggering for the 100,000 Wayuu who live in the communities covered by the IAHCHR decision. Despite the IAHCR ruling nearly 9 months ago, the Colombian authorities have done next to nothing to alleviate the suffering and untimely death of The Wayuu children, thus precipitating the August 1 Supreme Court decision which again orders the government to take urgent measures to address this crisis. In the meantime, as the IAHCR itself explains, the chief advocate on behalf of The Wayuu in these cases, Javier Rojas Uriana, has received death threats by right-wing paramilitaries trying to pressure him into halting his legal actions to protect The Wayuu. Just as remarkable as the dire situation facing The Wayuu is the almost total lack of press coverage regarding their situation. Thus, while the press covers the shortages in Venezuela nearly every day, and in a quite histrionic fashion which ignoresthe complexities and subtleties of the situation there, there is almost a total blackout of the real famine confronting The Wayuu of Colombia just over the border. And, it is this media blackout, even in the face of major rulings by both the IACHR and Colombia’s high court, which of course allows this famine to continue without pause.